Patrick Duncan (left) and Alfred Hutchinson (right), South African delegates to the first All African People's Conference (AAPC) in Accra, Ghana, December 1958. Hutchinson was a leader of the African National Congress in the Transvaal. From December 1956 until late 1958 he was one of the accused in the Treason Trial. Following his acquittal he left South Africa without a passport and went to Ghana and attended the AAPC on behalf of the ANC. He stayed in exile. Patrick Duncan was an anti-apartheid activist and at the time was a member of the Liberal Party and editor of "Contact." 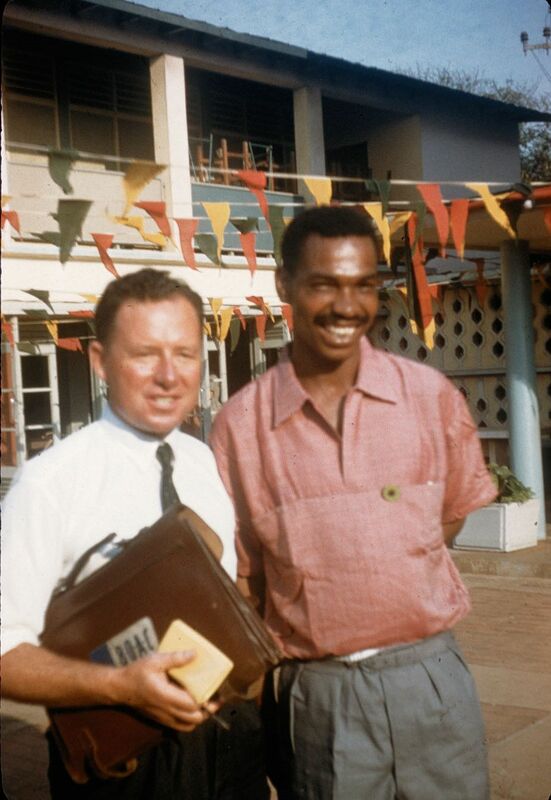 In 1963 Duncan went into exile and joined the Pan Africanist Congress. Used by permission of George M. Houser.